When I did some research into my blog analytics at the end of last year (in order to uncover the 10 most popular organizing posts of 2016), I was a little surprised to see that my post on "no Brainer things to toss during your kitchen declutter session" was at the very top of the list. OK. So you clearly liked this list! In keeping with my promise to deliver more concrete help with decluttering this year, I decided to go ahead and create a monthly "No Brainer Things to Toss Series". I'm all about giving you more of what you love! My plan is to create a monthly post centered around the specific area of the home that we're zeroing in on as part of the Organize & Refine Your Home Challenge. 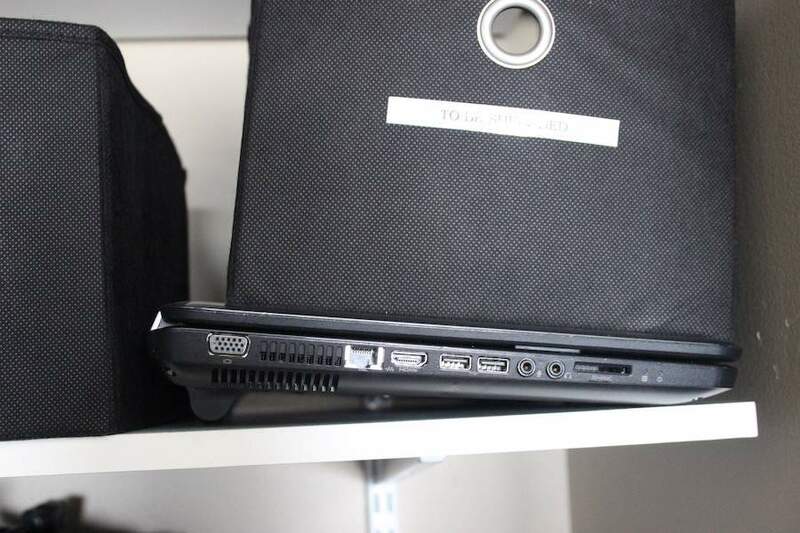 If you take a peek inside our home office closet, you’ll spot the sad remains of my 7-year old laptop PC. It no longer works and I’ve transferred all of the data from the hard drive to my current computer. Why is breaking up so hard to do? I’m mustering up the courage to take this relic to it’s final resting place this week. Look around your home office for old computers, printers, fax machines (gasp), etc. It’s time to let go of them my Friend. There you have it! What items will you be tossing from the list? What else would you add? 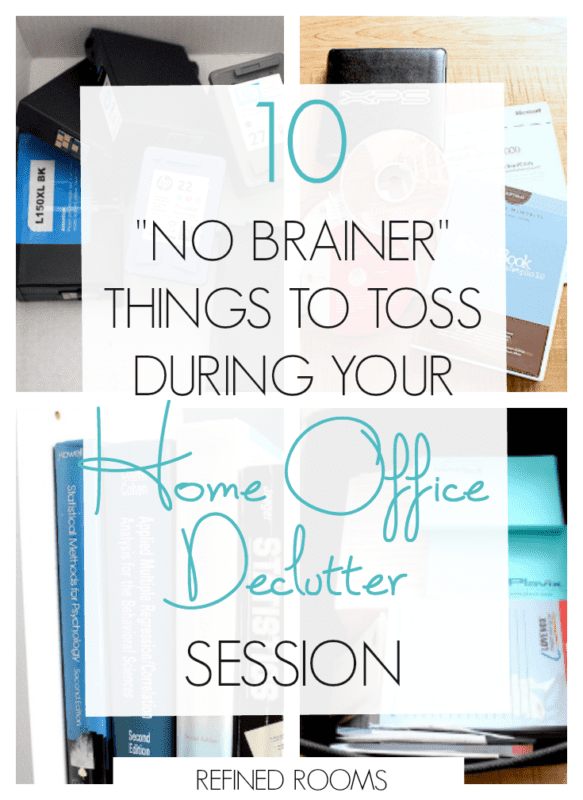 Share with the rest of us one of the items in your home office declutter toss pile! 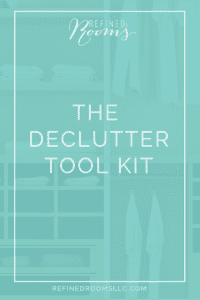 Need a little more help with decluttering & organizing your home office? What a great idea Jackie. Thanks for sharing! A quick tip for your readers who hold garage sales….A few years ago I did a major purge of office supplies while gathering stuff for my rummage sale: a ton of sticky notes (perhaps as many as you had), index cards, spiral notebooks, file folders, pens and markers, binders, etc. I made “office in a bag” packages and priced them reasonably. I sold out within the first hour. People loved them! And p.s. on the mystery cables. Do a little matching with your electronics first. I accidentally tossed a cord I needed for an air filtration system that I use only seasonally. I hope your readers are more careful than I was. “Office in a Bag”…That’s a fabulous idea Jean! Yes, I totally agree re: the electronics cords. In my case, that box has sat up in a corner of our office closet for years, without us so much as taking the lid off. I knew that if I hadn’t accessed any of those cords in that time, that they were all useless to us at this point. But a great warning for others! I have a craft room office combination that I am currently cleaning. I read your article with interest. I had tossed a bunch of mystery cords, old dvds and a mountain of pens that hubs must slowly bring home from work. I have to look at it again to see if I have some old excess stationary products I can donate away. I know one thing for certain, the minute I got rid of the excess it was much easier to locate what we needed. Great practical information here. Wow, if you can resell old text books, more power to you! I KNOW that everyone has that box of random cords!